The Pope is among the 11 trumps from the 22 major arcana that symbolize the various stages of the human condition, with the Papess, the Emperor, the Empress, the Mountebank, the Fool, the Devil, the Hanged Man, the Unnamed, the Lovers, and the Hermit. 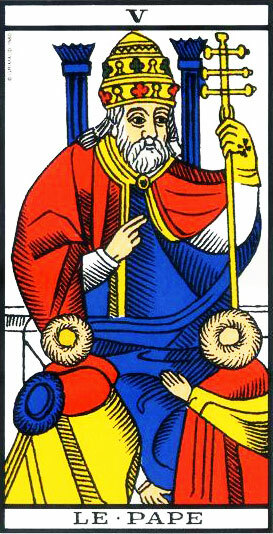 This Tarot card is a symbol for a wise, older man, the Elder who shares his wisdom through advice. It bears the number 5, an odd number and hence a symbol of motion. The Pope is respectable. People listen to him and follow his advice and opinion. It can protect current projects with a blessing. This is a strong protection that puts you under auspicious conditions. His benevolence and wisdom can facilitate any undertaking. 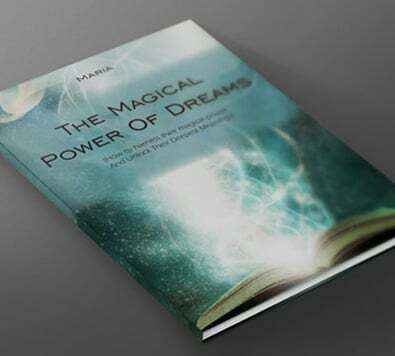 Drawing this Arcanum among the 22 tarot trumps must restore your confidence in your own abilities. If you want to succeed, you have to believe in yourself, else nothing can ever be achieved. The Pope tells you that you must not be scared to try. It does not mean that everything will happen without your lifting a finger but it does mean that all your actions will be positive and successful. This Arcanum is a very good sign for your professional life, but slightly less so regarding material goods and your love life. The Pope states that your mind will be strong, and your best ally for success. It also means that you will have the appropriate overview skills to take things into consideration and make the right decisions. However, you will only succeed against hostile forces if you behave with a noble heart, without trying to crush your opposition. It is not proper to humiliate an opponent or a competitor, and it will only breed some resentment that will one day get back to you! The Pope gives its consent for unions and associations. He can put an end to any conflict. He can enlighten anyone wise enough to make the most of his presence.